Monday's Perlman This Close Polio concert had an inspiring aspect which I thought I'd share with members of the district. The music was great, and so was the fellowship. Even as Rotarians we sometimes find meeting strangers somewhat intimidating. Monday's event reminded me it was worth the effort. The music itself was enjoyable. In my opinion, Stravinsky's Suite from The Firebird was exciting like I imagine it to have been in 1919 when this style was shockingly new. 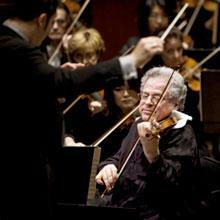 Perlman's performance of Mendelssohn's Violin Concerto in E Minor, Op 64, showed his virtuosity. All the more poignant was the presence of both polio survivors, Perlman using his canes to make his way on stage and the conductor, James DePreist, in his wheelchair while directing. It showed both the ravages of this disease, and the spirit of those who have dealt with it. My wife Marcie and I, leaving for Chicago at 6 for the 7:30 performance, found the traffic and parking manageable. Seats in the hall were good, with a mix of people from a wide variety of backgrounds. As enjoyable as the concert was, the other attendees were a great part as well. Let me try to give a sample, and a little humor from the evening. We had the opportunity to mention Arlington Rotary and our experiences, while hearing from Rotarians from other parts of the country. One was a Rotarian from Kentucky who had brought homemade Bourbon Balls for Itzhak Perlman. She told of her district volunteering to staff concession booths at the International Equestrian event there recently, raising about $200,000+ for the polio fight. We joked with a few 6440 Rotarians and met a President Elect from Ohio looking forward to her term and PETS training. There were two Rotarians from New York who read of the event in The Rotarian magazine and decided to stop on the way back home from a family birthday party in Alabama. A producer of the public service spots for the polio eradication campaign talked of how he got the celebrities together. His wife, born in Switzerland, now living in New York, answered questions comparing the spirit and mood there to that here in America. There was a brief conversation with Cardinal George, including his experience with polio. The desserts, snacks and beverages were good, the speeches not too long, and there was much good will. Maestro DePreist, during thank-you comments from his wheelchair, said that he and Perlman don't perform like this too often - they don't want to over emphasize the obvious - that they are both Jewish ! I've written this to give a sampling of the event, and to encourage us to take a risk and join in Rotary events when we can - a service trip to Guatemala, the District Conference, the International Convention in New Orleans. As the saying goes, "Try it, you'll like it !"